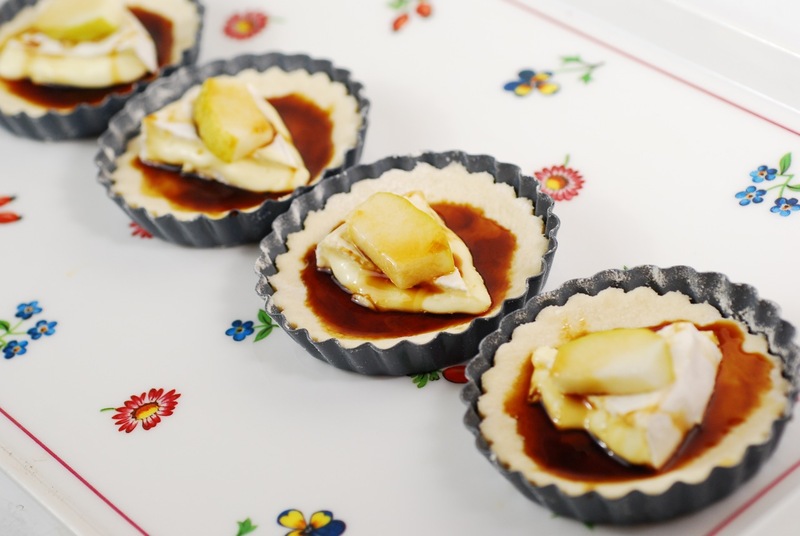 These brie-pear tartlets are subtle and richly delicious. 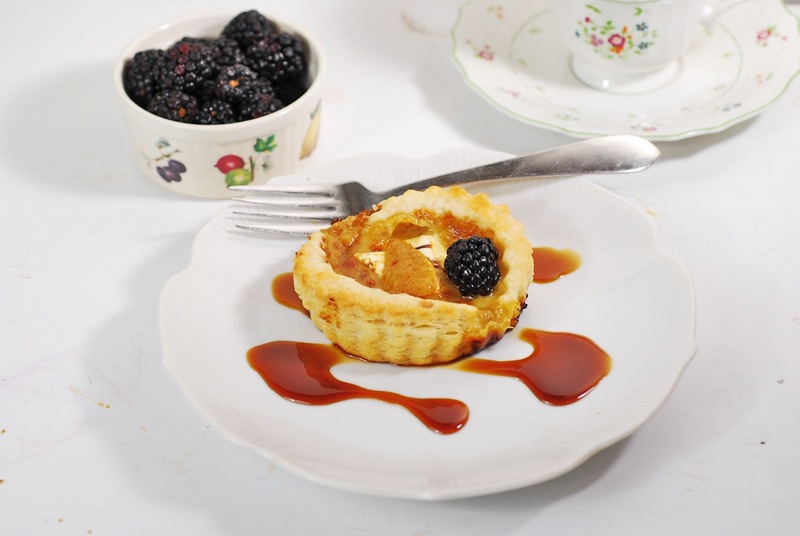 The delicacy of the cheese is echoed by puff pastry, and offset by the tart/sweet combination of pomegranate molasses/maple syrup glaze. They are fun to make, and are a truly elegant dessert. My latest batch of brie and camembert is now ripe, so I've been considering different ways to use them. 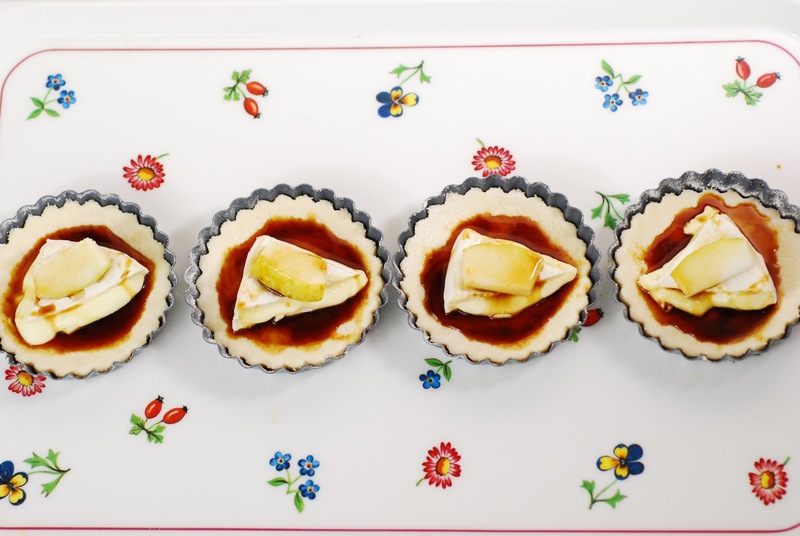 Brie has different characteristics than other cheeses when melted; it's quite mild and buttery, and the flavor can be a backdrop for other, stronger flavors. 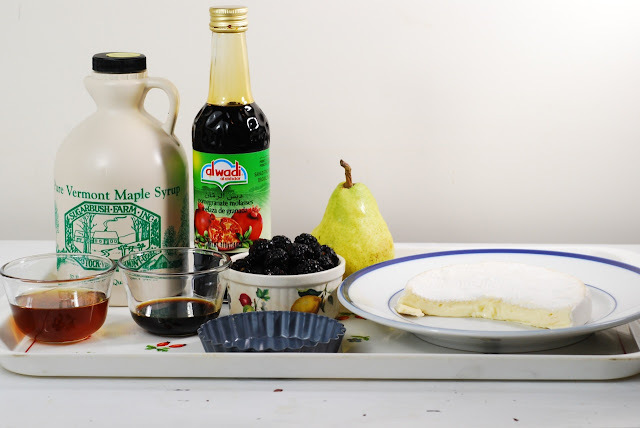 In this recipe, I've combined pomegranate molasses with Vermont maple syrup for a new taste that is really quite remarkable. I think you'll like how this works with the cheese. Place 6 small (3-inch) tartlet pans with removable bottoms on a jelly roll pan. 1 small wheel real brie, either homemade or high-quality imported brie. Put the flour in a circle on the counter. Place the thick sourdough starter in the center of the circle. Using a plastic spatula, fold the flour up and into the starter, until a soft dough is formed. Using your fingers, work a bit more flour into the dough, until most of the flour is incorporated, and the dough is firm enough to roll out. Roll the dough on the floured counter, to a 12-inch square. Using a cheese slicer, take thin slices of the butter and make a 5-inch diamond in the center of the square. There will be several layers of butter slices. Pat, then roll gently to a rectagle. Fold like a letter: right side folds to a point 2/3 up the length. Then the left side folds over the right, to the edge, forming 3 equal layers. Roll out and give one more turn. The pastry is ready to use; roll to a 10-inch square, and refrigerate on a floured plate until ready to use. Roll out the pastry to 1/4 inch thick. 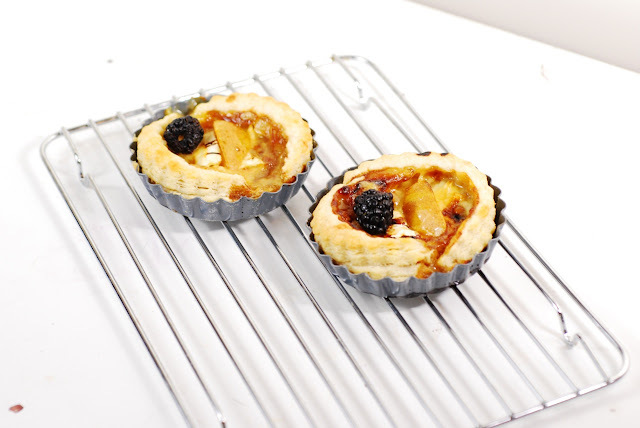 Using the tartlet pan as a cookie cutter, cut a piece of dough. Invert and let the dough slide down into the pan slightly. Using another pan, cut a second circle, then cut a hole in the center with a biscuit cutter. This forms a ring to use as the edge piece to lay on after filling. 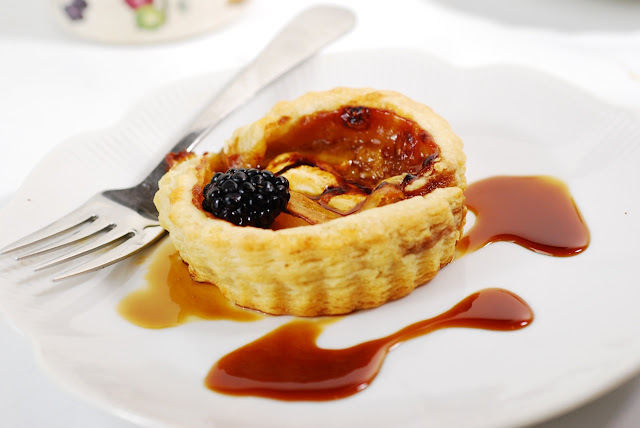 Drizzle a small amount of pomegranate molasses into the center of the shell. Place a small wedge of brie on top, then a small wedge of pear on top of the brie. Drizzle on a bit more (around 1 tsp) pomegranate molasses, then 1/2 tsp maple syrup. Bake for 20 minutes at 425F or until puffed and golden. Cool slightly, then remove from forms. Decorate with a berry or other fruit. In a bowl, combine 3 T each of pomegranate molasses and maple syrup. 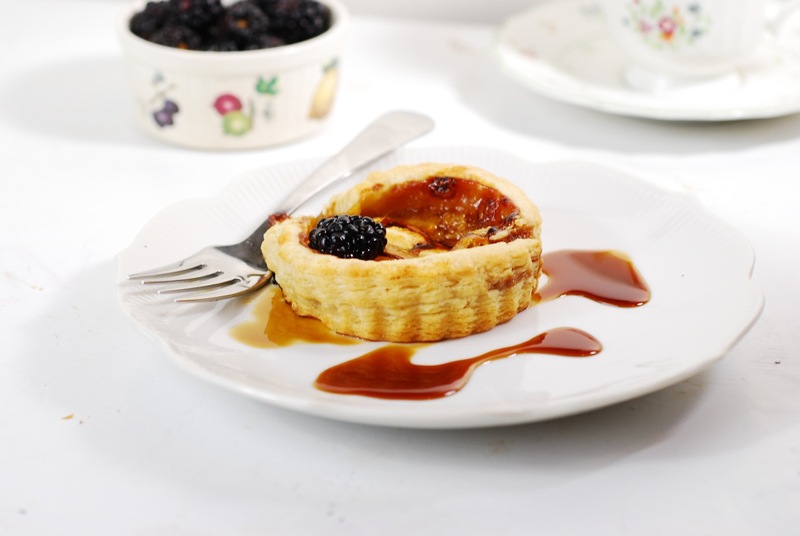 Drizzle liberally on plate, then top with a tartlet.